Did you know that all you need to make sauerkraut is cabbage + salt + time? True story. Not only is it so, so easy to make, it is SO GOOD FOR YOU. Homemade sauerkraut is ALIVE and chock full of probiotics- those beneficial bacteria that help maintain levels of happy flora in your gut. 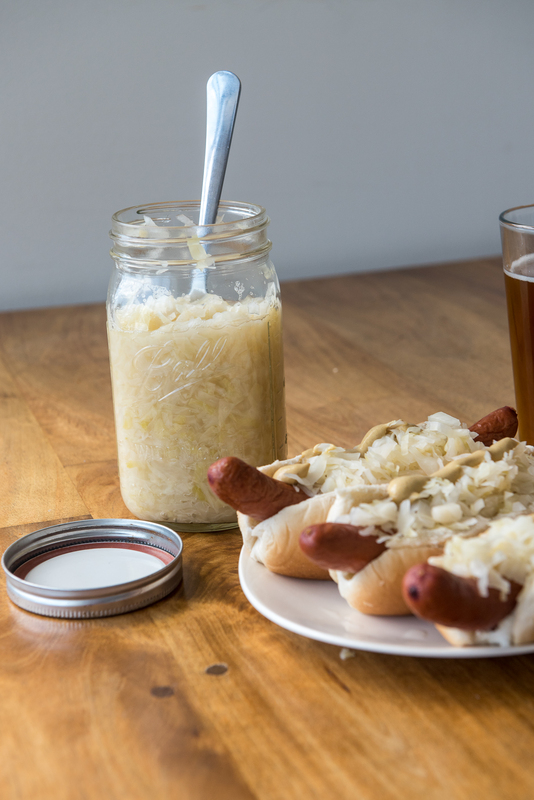 I know I am biased, because I have a long running love affair with all things pickled, but sauerkraut is delicious on all sorts of things other than hot dogs and reubens. One of my favorite combos is seafood (think seafood sausage or poached halibut) with lemony homemade mayo and sauerkraut. Recently, I submitted a recipe to Food Republic.com detailing the steps necessary to make sauerkraut at home. You can find it here. Enjoy! Looks and sounds delicious. Wish I liked Sauerkraut! Maybe a little sugar could be added?